UMW has a Christmas Store each year. Numerous children came to make purchases for family and friends. With the help of many volunteers, this event is very successful. There is a huge selection of items. 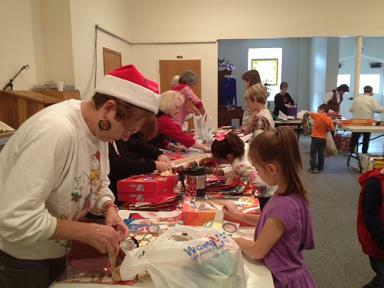 Volunteers help children make those important decisions and also many help with wrapping and tagging. 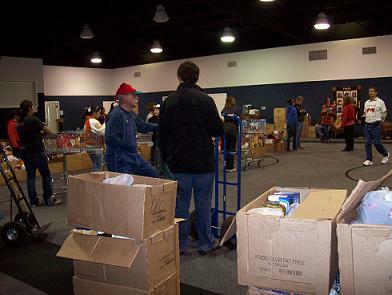 Thanks to all who donate....and thanks to the many volunteers who help make the Christmas Store successful. We appreciate their time and dedication. When the date is determined, it will be posted in the Events tab. 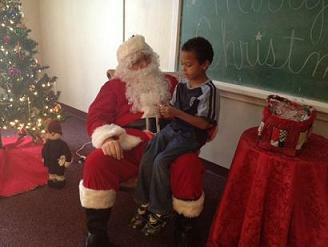 These photos tell some of the story about the Caring & Sharing effort to provide toys and food to those in need. This effort begins in early June when 600 large red stockings are cut and many volunteers sew these to be ready for the toy collection. The effort really picks up steam in November when everything begins arriving at the Ministries Center. The supply of toys is over-whelming. Food is brought and boxes are filled. So many of our church members work for days getting ready. 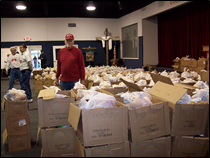 As a result, numerous families receive two to four boxes of food, depending on the family size. Each family also receive a frozen frying hen, and larger families receive a hen and turkey. 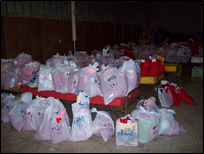 Six hundred children receive Christmas stockings and toys, and the elderly are also given gifts. What a spectacular outpouring of community sharing! Recently on a very hot couple of days, volunteers from UMM built a ramp for Terry Everett. Those who contributed are: Ed Castro, Larry Gackle, Art Gould, Larry Jones, Chuck Lowery, Bob Mallory, Charlie Wright, along with Wilford Jones. Throngs of children partake of the free eye exam, dental check, haircuts, and receive their back packs each year. The Kiwanis and First United Methodist Church are partners in making this event successful.